My first taste of these little beauties was when we were travelling around the Kruger Safari park in South Africa in 2002. Mark's aunty Marigold who we'd been staying with in Johannesburg packed us off on our travels with a few days' worth of muffins (her friend Maureen's recipe) to eat for our breakfast. They have since become somewhat legendary in our extended family. I have memories of eating these while driving through the park very early one morning and seeing a mummy and baby elephant walk out onto the road right in front of us...wow. When Mark first tried them, he was awfully suspicious that the sunflower seeds were mouldy...not aware that's just the green colour they turn when cooked in this recipe....ha ha! As we left after our South African adventure, Marigold kindly gave us her own copy of the recipe to take on to the new life we were embarking on together in NZ. You can tell a sure-fire winner in our house by how well worn and covered in food the recipe page is. Judging by this page, it's a firm favourite wouldn't you say! 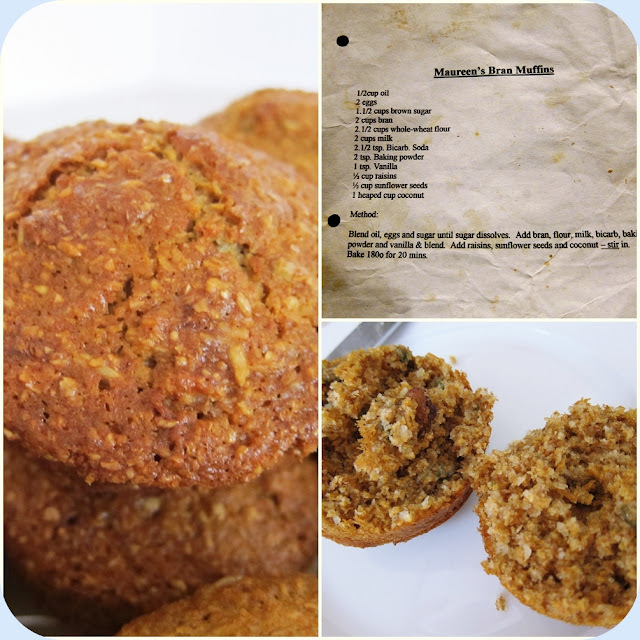 These muffins are super quick to make a big batch (about 22), use oil instead of butter and are full of sultanas, bran, sunflower seeds and coconut, so not only tasty but half healthy too! Mix oil, eggs and brown sugar together until sugar dissolves. Add bran, flour, milk, baking soda, baking powder, vanilla and mix until all mixed in. Add sultanas, sunflower seeds and coconut - stir in. Bake at 180 degrees for 15-20 minutes. In memory of Mark's aunty Marigold who passed away in June 2009. Those look amazing! I'll be trying them soon!! I remember making something like these in form 2 Home Ec. My strange teacher at the time laughed and then said..."The fiber in this will keep ya regular"